When his mother's health meant she could no longer help, Trevor needed somewhere to live that offered extra support. Trevor lives in Tunbridge Wells, in a housing scheme run by Peabody and Moat, for adults who have learning disabilities and need additional support. 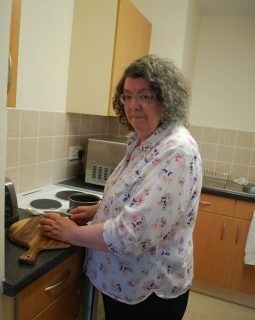 As an adult with a learning disability, Trevor had lived at home with his mother for his entire life until he made the move to supported housing in March 2004. He’s been there ever since. “Due to my mother’s ill health, she could no longer support me. My care manager suggested supported housing as an option. Then, after a visit to look around the Old Dairy I decided to give it a go. Trevor says the biggest differences the move made to his life have come from improved personal independence, a safe environment to live in and a community of friends, from which to form a better social life. “Living here, I have been given support to find suitable employment when I could work and given help with all my benefits now that I am unable to work”. Trevor is not sure what would have happened to him if it wasn’t for supported housing. He believes there is a possibility he would have ended up living on the streets. “A safe place to live, with support suited to me”.